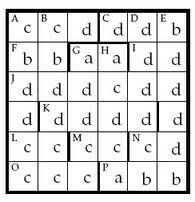 What is a Crossnumber Puzzle? 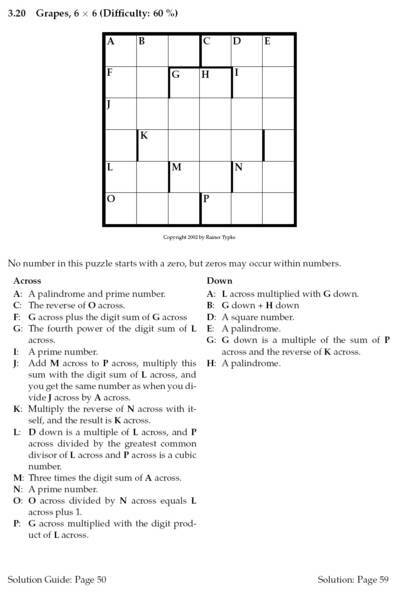 Every puzzle in the book is accompanied by a solution guide and a solution. An example is shown below. The solution guide suggests one possible order of tackling the boxes, in other words, it tells you which ones are easier to fill first. 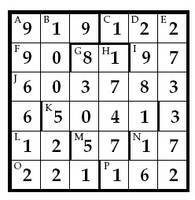 This might help you if you get stuck, but don't want to look up the solution. You can preview more pages here. Solution guide (left) and solution (right). Boxes which are easy to fill first are marked with "a", somewhat harder ones with "b" and so on. In this example, the solution guide therefore suggests to start with G across, and it also points out that since H down is a palindrome, this gives you the first digit of P across (also marked with "a"). Once you have that, you can tackle the rest of P across ("b") etc.